“Hey, listen” came a voice from the front as I was walking towards my office. I looked up and found a woman in her middle age carrying a basket full of fruits. Assuming she was calling someone walking behind me, I ignored the call and moved forward. “Hey, listen – I am talking to you.” This one came directly for me. I stopped and asked, “Are you talking to me?” “Yes, I am, I’ve been calling you since I know you are lucky for me” – said the woman. “But.. but I don’t need any fruits right now.”, said I. “That is fine, you can give it to someone else but take these fruits from me” came the response. Nonplussed, I said – “Okay, give me some grapes and pomegranate, how much does this cost”? “Well, you can give me Rs.200 for one box. That’s what they charge in shops”. She took out two boxes of grapes and handed over to me. “I just need one box, please”, I clarified to her. “I told you, you are lucky for me. So please take these two boxes, I’ll also give you few pomegranates free of charge” – said the woman. Even before I could say anything, I was standing with two boxes and some pomegranates in my hand because I knew there was no escape. I handed over Rs.400 and continued to my destination. All the time on my way back, I kept thinking – maybe she was just applying a marketing strategy or maybe she was genuinely looking for someone to start her year well with some good business. Nevertheless, the cost occurred was worth it, since what I got from her was healthier than what I would have spent in a restaurant for a burger or a pizza. And above everything else, I was satisfied thinking about the woman and the stories she will get to narrate at home. For those who have already viewed my post “A conversation“, I have tried to come up with the French version of the same. Being a beginner in French, I am trying to put this more into practice so I don’t forget what I learnt. But I’ll be honest, I had to take help from Google translator too. Feel free to suggest corrections if any in the comment section below. Moi: Dans mes rêves ces jours-ci, j’ai vu des célébrités que j’admire. Qu’est-ce que ça veut dire? Mon amie: Peut-être, il y a des choses plus grandes qui t’attendent. Moi: Que voulez-vous dire par critère de réussite? Mon amie: Je veux dire, ne pensez pas que si vous ne pouvez pas rencontrer ces célébrités, votre vie ne réussit pas. Le succès est lorsque les personnes qui s’occupent de vous et que vous aimez, se multiplient, ou avec ceux qui existent, le lien s’approfondit. Vous faites des actes de bonté et êtes bénis par les gens même si vous ne savez pas. C’est le succès. Les gens que vous rencontrez sur votre chemin sont vos célébrités et pour ceux que vous apportez de l’espoir, vous êtes une célébrité pour eux. Moi: Parfait. Je n’ai jamais pensé de cette façon. Vous êtes un excellent interprète de rêve. My love for music, my role model and my roots. A.R. Rahman “Encore” , an experience of a lifetime and a dream come true. 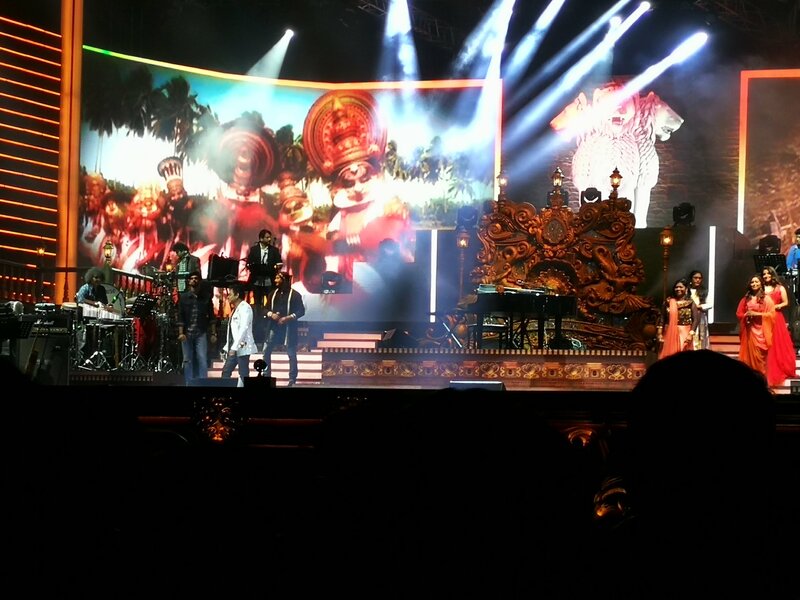 So awestruck by the beauty of the sets and above all the patience with which the concert was performed by Rahman Sir. I could see him doing everything at a time – playing music on multiple instruments, singing and with a smile on his face cheering up each and everyone of his crew members. Makes me feel he is not just an extraordinary person but an institution of learning to be a better human being. Wonder how much people associated with him have learnt all through these years. Long live Rahman sir and his music. Jai Ho! Can be as simple as this one if we take a pause and enjoy those precious moments.